Has the time come again to find yourself a new vehicle to get you around Kelowna? Have you settled in on an SUV being the type of vehicle that you want? If this is the case, then you should visit Kelowna Chrysler Dodge Jeep to get a better look at the 2019 Jeep Grand Cherokee. 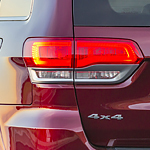 The are many features in the Grand Cherokee to get excited about. There are two engine types available based on with model of the Grand Cherokee that you choose. The SRT model comes with a 6.4L V8 that puts out 475 horsepower. The Trackhawk model of the Cherokee comes with a 6.2L supercharged V8 engine that puts out 707 horsepower. Both have a maximum tow rating of 3,265 kg (7,200 pounds). Each version of the Grand Cherokee has slingshot acceleration. When the track drive mode is selected on the Standard Launch Control, the engine, transmission, driveline and suspension are optimized for fast launch and straight-line acceleration.